Ten years ago. That’s when it all began. That’s when Seattle area craft beer lovers got to experience the first ever Seattle Beer Week and the first ever official Seattle Beer Week beer (a double IPA from Pike Brewing Company). Back then, many of our favorite local craft breweries and craft beer bars didn’t even exist yet. Whereas today, it seems, we have a craft brewery or craft beer bar around almost every corner. More craft breweries and more craft beer bars means even more Seattle Beer Week events. Are you ready? Surviving the week (actually 11 days) will take careful planning. I’m here to give you some suggestions on which events you might want to check out. So sit back, if you’ve managed to pick up any yet, grab yourself a can of this year’s official Seattle Beer Week beer – Citrus Galaxy IPA from Georgetown Brewing Company – and take a look a Craft Beer Monger’s Picks for Seattle Beer Week 10. Maybe it’s just me, but it feels like the past year has flown by so quickly. Seattle Beer Week #8 almost feels like it was just a few weeks ago. Yet here we are, with Seattle Beer Week #9 kicking off in just two days. Have you had an opportunity to look over the ever-growing list of events on the official Seattle Beer Week website? With so many events to choose from, many of which happen on the same day or even at the same time, you may have to make some difficult choices regarding which events to attend. Here are my top picks for Seattle Beer Week #9. Things get under way with the Official Seattle Beer Week Kickoff this Thursday, May 4th. There are 5 stops on the Seattle Beer Week (SBW) kickoff tour. Things start off at 4:30 pm at the new Flatstick Pub location in Pioneer Square. The other stops on this year’s kickoff tour include: Beveridge Place Pub (6:30 pm and Cask-O-Rama will be going on), Brouwer’s Cafe (7:45 pm), Naked City Brewery & Taphouse (9:00 pm), with the evening closing out at The Pine Box (10:30 pm). As I’m sure most of you already know, Seattle Beer Week kicks off next Thursday, May 4th. Exactly one week later (but still during Seattle Beer Week, which continues until the 14th), Seattle’s premiere artisan-focused restaurant, Lark, will be hosting a gourmet beer dinner, featuring their own artisan cuisine and beers from two of Seattle’s newest and hottest breweries: Cloudburst Brewing and Holy Mountain Brewing. This is just one of several dinners you’ll find listed on the events page for Seattle Beer Week, but this is the only one where you can enjoy Chef John Sundstrom’s gourmet offerings of locally-produced and organic cheese, charcuterie, vegetables, grains, fish, and meats, all prepared in season, as well as beers from both Cloudburst and Holy Mountain. Today, Monday May 16th, is day number 5 of Seattle Beer Week #8, which means we’re about halfway through. Things kicked off last Thursday at Reuben’s Brews with the official tapping of the first keg of the official Seattle Beer Week beer: Daily Pale, followed by the opening night pub crawl. I had to drop by Reuben’s, of course, for the kickoff and then found my way to Beveridge Place Pub for stop #3 on the crawl. Since then, the events have been coming pretty much non-stop. The highlights for me so far have been the Underberg Back In Black Stout Fest at Brouwer’s Cafe, Satanic Metal C.O.W. Night at Toronado and, even though I had to leave a bit early, Firestone Walker & Holy Mountain last night at The Pine Box. I don’t know about you, but I’ve had a pretty crazy last week or so leading up to Seattle Beer Week #8. Between being busy at work (both of them), still mourning a bit for our dog, Bailei, and trying to plan out my Seattle Beer Week 2016 schedule (picking from, literally, hundreds of events), I’ve barely had time to breathe. Now, it’s here. 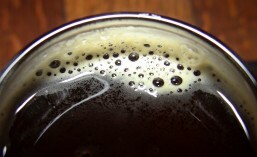 Seattle Beer Week kicks off this evening at Reuben’s Brews in Ballard. They’ll be open at noon today, but the official opening ceremony for Seattle Beer Week won’t take place until 5 pm. The first keg of Daily Pale, the official beer of Seattle Beer Week #8, will be tapped and the Mayor’s Proclamation will be read. New breweries open in Seattle at quite a rapid pace. In fact, there are still several new breweries I have yet to visit, including: Cloudburst Brewing, Optimism Brewing, Lucky Envelope Brewing and more. With so many ‘new guys’ out there, it can be difficult for a new brewery to really set themselves apart from the crowd. Every now and then, however, a new local brewery opens that really grabs my attention. One such brewery, which just celebrated their 1st anniversary, is Holy Mountain Brewing Company in Seattle’s Interbay neighborhood on Elliott Avenue West. Why have they grabbed my attention? It’s not because of some flashy ad campaign. In fact, they barely advertise. They don’t need to. So far, word of mouth has been doing the trick and drawing the crowds. It’s also not because of some fancy, over-the-top taproom. The taproom at Holy Mountain is actually rather minimalist; mostly white with lots of subway tile. No, the reason Holy Mountain has caught my (and everyone else’s) attention is for the best reason of all: the beers. New craft breweries are popping up at an amazing rate these days. I’m sure you’ve heard the news that, as of December 2015, there are now more operating breweries in the U.S. than at any other time in U.S. history (4,144). That’s an impressive statistic and it means that we craft beer lovers have more choice in what we drink than ever before. With so many new breweries around, what can a brewery do to really stand out? That hasn’t been a problem for Holy Mountain Brewing. Specializing in seasonal releases, including barrel-fermented beers, they have created a brewery that prominently features several different unique, barrel-aged beers, with no particular ‘Flagship’ beer in mind. In the short time they’ve been around they’ve become extremely popular, and I’ve amassed a pretty good selection of Holy Mountain beers in my cellar. After years of planning and preparation, Head Brewer Colin Lenfesty, President Adam Paysse and VP of Sales Mike Murphy, are preparing to start distributing beers from Holy Mountain Brewing in the Seattle market. Starting out in a small industrial space in Seattle’s SoDo neighborhood back in 2010, Colin and Adam spent their evenings brewing pilot batches, refining their brewing techniques and recipes along the way. Holy Mountain Brewing will specialize in seasonal releases, including barrel-fermented beers. They intend to create a brewery that will prominently feature several different unique, barrel-aged beers, with no particular ‘Flagship’ beer in mind.